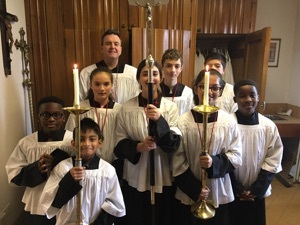 We are privileged to have a great team of altar servers in our parish. 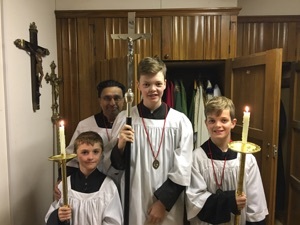 Young people may begin serving once they have received their First Holy Communion, and after a year of faithful ministry, they may receive their medal inducting them into the Guild of St Stephen for altar servers. Our senior Master of Ceremonies is Mr Christopher O’Connor. Servers at the 9.00 Mass serve under the direction of Gregory Bratza. 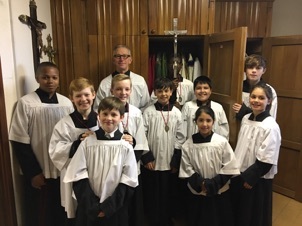 Servers at the 10.45 Mass serve under the direction of Christopher O’Connor. 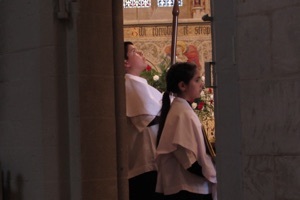 Servers at the 5.15 Mass serve under the direction of Anthony D’Souza. The greater ceremonies of the year are served by all servers after rehearsal, and there is normally a treat for them associated with this. 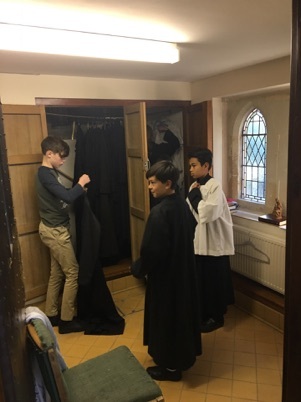 Those who wish to serve must present themselves in the sacristy at least ten minutes before Mass, and wearing smart black shoes (school shoes are fine). Those with long hair must tie it back neatly.